Note: Since the time this article was written, the State Legislature has legalized passing a bicyclist in a no-passing zone when done safely with no oncoming traffic and adequate sight distance, passing at a distance of at least four feet or moving completely into the next lane. See § 20-150. Limitations on privilege of overtaking and passing. This paper provides an overview of existing passing laws in North Carolina and other states as related to safe passing of bicyclists. Operational, geometric and enforcement issues related to same-lane versus next-lane passing are discussed. Recommendations by BikeWalk NC are presented in the concluding remarks. Existing state law identifies the conditions required for safe and legal passing based on traffic conditions, road features and sight distances. Passing of vehicles must be done on the left unless in a separate marked lane. Passing within the same marked lane is permitted only when it can be done safely and at no less than two feet of separation under NC law. Drivers who move into the adjacent lane to pass must yield to other drivers in that lane before doing so, and may not move back into the passed drivers’ lane until safely clear. When the adjacent lane carries opposite-direction traffic, drivers must not pass where limited sight distance prevents sufficiently early detection of oncoming traffic that may be affected by the pass, or at an intersection. Passing may be prohibited by roadway markings, typically due to insufficient sight distance to safely pass a motor vehicle traveling just below the speed limit. (d) Whenever any street has been divided into two or more clearly marked lanes for traffic, the following rules in addition to all others consistent herewith shall apply. § 20-149. Overtaking a vehicle. (a) The driver of any such vehicle overtaking another vehicle proceeding in the same direction shall pass at least two feet to the left thereof, and shall not again drive to the right side of the highway until safely clear of such overtaken vehicle. This subsection shall not apply when the overtaking and passing is done pursuant to the provisions of G.S. 20-150.1. (b) Except when overtaking and passing on the right is permitted, the driver of an overtaken vehicle shall give way to the right in favor of the overtaking vehicle while being lawfully overtaken on audible signal and shall not increase the speed of his vehicle until completely passed by the overtaking vehicle. (1) Is a Class 1 misdemeanor when the failure is the proximate cause of a collision resulting in serious bodily injury. (2) Is a Class 2 misdemeanor when the failure is the proximate cause of a collision resulting in bodily injury or property damage. (3) Is, in all other cases, an infraction. (b) The driver of a vehicle shall not overtake and pass another vehicle proceeding in the same direction upon the crest of a grade or upon a curve in the highway where the driver’s view along the highway is obstructed within a distance of 500 feet. (c) The driver of a vehicle shall not overtake and pass any other vehicle proceeding in the same direction at any railway grade crossing nor at any intersection of highway unless permitted so to do by a traffic or police officer. For the purposes of this section the words “intersection of highway” shall be defined and limited to intersections designated and marked by the Department of Transportation by appropriate signs, and street intersections in cities and towns. (d) The driver of a vehicle shall not drive to the left side of the centerline of a highway upon the crest of a grade or upon a curve in the highway where such centerline has been placed upon such highway by the Department of Transportation, and is visible. (e) The driver of a vehicle shall not overtake and pass another on any portion of the highway which is marked by signs, markers or markings placed by the Department of Transportation stating or clearly indicating that passing should not be attempted. (f) The foregoing limitations shall not apply upon a one-way street nor to the driver of a vehicle turning left in or from an alley, private road, or driveway. § 20-150.1. When passing on the right is permitted. Bicyclists must move laterally to maintain balance and to avoid surface hazards. They require a significant area of good pavement to both sides of their wheels to facilitate control and recovery. 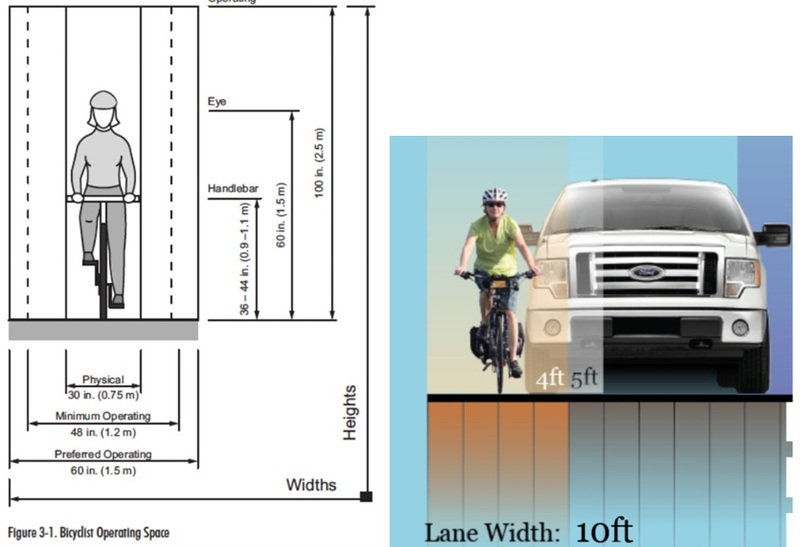 AASHTO defines the minimum operating space for a bicyclist to be 48 inches, and the preferred operating space to be at least 60 inches. Bicyclists can be destabilized by wind blasts from passing vehicles, and are not surrounded by a safety cage. For these reasons, greater minimum passing distance is recommended for passing bicyclists than for passing dual track vehicles. Three feet is commonly described as a minimum safe distance for passing bicyclists, but greater distance is recommended as speeds increase. Scale diagrams of different vehicles, pavement widths and remaining clearance distances for same-lane passing are shown below. Left: AASHTO “Bike Guide” illustration of bicyclist operating space. Right: A pickup truck cannot pass an edge-riding bicyclist within the same 10 foot wide travel lane. Some urban streets feature lanes that are 14 feet or wider, sometimes to facilitate passing of parked vehicles or bicycle traffic. 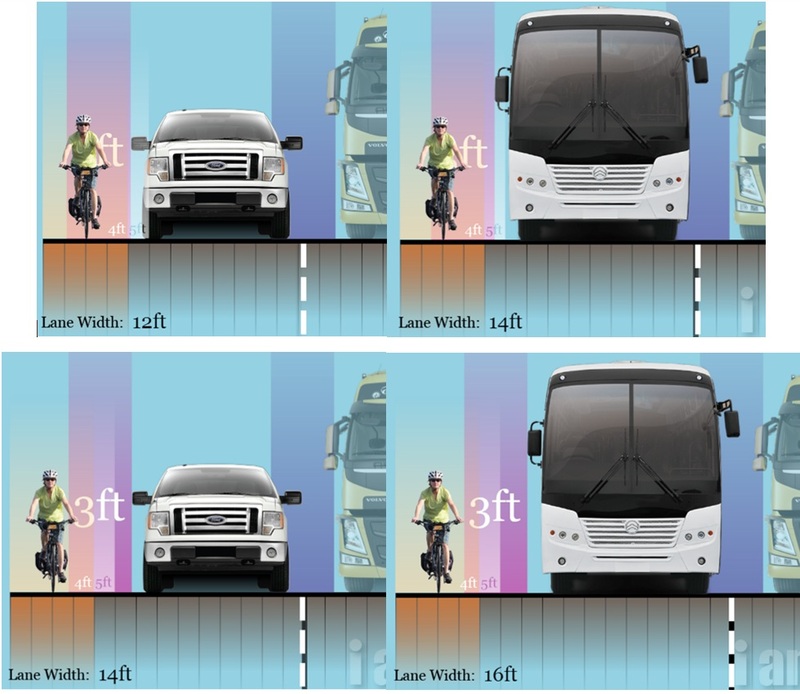 The minimum recommended combined width for a general purpose lane and adjacent bicycle lane is 16 feet to accommodate safe passing by wide vehicles such as trucks and buses. However, most important roads feature only general purpose marked travel lanes that are 10 to 12 feet wide. In North Carolina, 74% of car-overtaking-bike collisions occur on two-lane roads. Most of these occur in rural areas, and most involve roads with posted speed limits of 40 mph or greater. BikeWalk NC’s investigations of overtaking collisions indicate that most such collisions involve narrow travel lanes where the bicyclist was operating at the right edge of the lane. About half of US states define three feet as the minimum lateral clearance distance for legal passing of bicyclists. A summary of state requirements for passing distance appears below. The minimum operating space and passing distance required for safety means that motor vehicle drivers cannot pass bicyclists safely within most marked travel lanes (10-12 feet wide), and therefore must usually move into the next lane to pass safely. On many two-lane roads, solid centerlines are often marked indicating a prohibition on use of the adjacent lane to pass. Engineering policy for marking solid versus broken centerlines is based on the minimum sight distance required to pass a motor vehicle traveling just below the maximum posted speed limit. The sight distance required to pass a slow moving bicyclist in the next lane is much shorter. For instance, safely passing a motorist traveling at 35 mph on a 45 mph road requires a sight distance 600 feet longer than passing a 15 mph bicyclist on the same road. Most motorists recognize this, and will cross a solid centerline to pass a bicyclist when there is no risk of collision with oncoming traffic. Practically no motorists will follow a bicyclist for miles at reduced speed (waiting until they reach a broken centerline), but some may be tempted to squeeze by within the bicyclist’s lane at unsafe distance, or to pass without yielding to oncoming traffic. Most daytime overtaking car-bike collisions involve failed attempts at same-lane passing in narrow lanes. Many public safety officials, including many police, want to encourage drivers to pass bicyclists more safely, but may feel hindered from giving useful advice by the solid centerline law. A stationary obstruction such as a fallen tree limb could be found anywhere, including places where there is only enough sight distance for an oncoming driver to stop. If a driver proceeds left of center around an obstruction at sufficiently slow speed when no conflicting traffic is visible, oncoming drivers who arrive from beyond view should be able slow or stop in time to avoid collision and allow completion of the maneuver (because all drivers are required to limit their speed so that they can stop within their sight distance). The obstruction exception law does not prohibit the passing driver from requiring oncoming traffic to slow, it only requires that the passing driver not create an immediate hazard. It is the short distance required for passing a stationary obstruction that makes this maneuver safe in most places. But if the obstruction is actually a moving object, this increases the distance and time required to pass as a function of the object’s speed. Drivers tend to be very good at estimating the time and distance required to pass stationary and slow moving vehicles, but less accurate as speeds increase. Grave mistakes made at high speeds are what motivated the installation of the solid centerlines that designate no passing zones. Many bicyclists, police, and legislators recognize the inadequacy of treating bicyclists as “obstructions” under the law, while also recognizing that solid centerlines are unreasonably restrictive in the context of passing slow moving bicyclists. As a result, states are moving toward relaxing the solid centerline passing prohibition for passing of bicyclists under conditions where such passing is safe. At the time of this writing, eight states (Colorado, Maine, Mississippi, Montana, Ohio, Pennsylvania, Utah and Wisconsin) have provisions in their passing laws to allow crossing a solid centerline to pass a bicyclist when safe, as shown below. (d) To the driver of a vehicle passing a bicyclist moving the same direction and in the same lane when such movement can be made in safety and without interfering with, impeding, or endangering other traffic lawfully using the highway. 61-8-326 (2) (a) Except as provided in subsection (b), where official traffic control devices are in place to define a no-passing zone as set forth in subsection (1) an operator of a vehicle may not drive on the left side of the center of the roadway within the no-passing zone or on the left side of a pavement striping designed to mark the no-passing zone throughout its length. (iii) there is sufficient clear sight distance to the left side of the center of the roadway to meet the overtaking and passing requirements in 61-8-325. (3) (a) Except as provided in par. (b), the operator of a vehicle shall not drive on the left side of the center of a roadway on any portion thereof which has been designated a no-passing zone, either by signs or by a yellow unbroken line on the pavement on the right-hand side of and adjacent to the center line of the roadway, provided such signs or lines would be clearly visible to an ordinarily observant person. (b) The operator of a vehicle may drive on the left side of the center of a roadway on any portion thereof which has been designated a no-passing zone, as described in par. (a), to overtake and pass, with care, any vehicle, except an implement of husbandry or agricultural commercial motor vehicle, traveling at a speed less than half of the applicable speed limit at the place of passing. Events in California reveal law enforcement problems arising from the lack of an exception to the state’s solid centerline passing prohibition. In multiple instances, California Highway Patrol officers have told bicyclists that motorists are not allowed to move left of center to pass bicyclists, and therefore bicyclists have a duty to stay far enough right to allow motorists to pass within the same narrow lane, or else face citation. BikeWalk NC recommends that North Carolina’s passing law be based on a geometrically sound and physically functional concept of operations for safe passing of bicyclists on existing roads. Given the narrow width of most existing travel lanes, most safe passing maneuvers will require use of space in the adjacent lane. This in turn requires that drivers look for, yield to, and potentially wait for other traffic (and ensure safe sight distance) before passing. Prudent drivers who take these steps before passing bicyclists don’t collide with bicyclists or other vehicles. Bikewalk NC recommends that state law be brought into alignment with best practices for passing (via movement into the adjacent lane) by relaxing the solid centerline prohibition on passing, allowing drivers to cross it when safe to pass bicyclists. All of the other legal limitations on the privilege of overtaking and passing would remain in effect. BikeWalk NC believes this first step is essential to allowing police, NCDOT, and other members of the public to participate in meaningful conversations, education activities and enforcement campaigns related to safe passing of bicyclists. Bikewalk NC does not recommend pursuit of “3 feet” or similar legislation at this time. Bikewalk NC believes that the current legislature will be unfriendly to a bill that places new constraints on motorists in order to benefit bicyclists, and will likely attempt to amend such a bill with new restrictions on bicyclists that will interfere with bicyclists’ ability to exercise defensive bicycling techniques and/or reach their destinations, as has happened with legislation in other states (such as in Washington, where in 2011 legislators attempted to prohibit bicyclists’ roadway use where a shoulder existed). BikeWalk NC recommends that relaxation of the solid centerline law be followed by comprehensive education and enforcement activities to promote public understanding of bicyclists’ roadway rights and best practices for safe passing and bicycle driving. 20-150. Limitations on privilege of overtaking and passing. (e) The driver of a vehicle shall not overtake and pass another on any portion of the highway which is marked by signs, markers or markings placed by the Department of Transportation stating or clearly indicating that passing should not be attempted. This subsection shall not apply when passing a bicycle traveling less than half the maximum posted speed limit when such a pass can be completed safely and in compliance with subsections (a), (b), (c) and (d) of this section. Is in compliance with subsections (a), (b), (c), and (d) of this section. Provides a minimum of 4’ or completely enters the left lane. And the operators of bicycles that will be passed has not provided signal of their intention to perform a left turn. The full language of NCDOT’s proposal can be read here. BikeWalk NC subsequently endorsed the language proposed by NCDOT. The Study Committee then voted to recommend NCDOT’s proposed language to change 20-150 (e). or (ii) completely enters the left lane of the highway. 2. Consider a driver planning a pass on a 45 mph road. Observation of real-world behavior shows that drivers take an average of seven seconds to pass a 15 mph bicyclist (with a speed differential of 10 mph), but an average of ten seconds to pass a 35 mph car. A seven second pass at 25 mph covers about 256 feet worst case (shorter with acceleration). By comparison, a ten second pass at 45 mph covers about 660 feet. An oncoming 45 mph driver travels 462 feet in seven seconds and 660 feet in 10 seconds. Calculation of the required minimum safe passing sight distance in the average bicyclist case includes the total traveled distance of 256+462 = 718 feet, 602 feet shorter than in the average motorist case (660+660=1320).